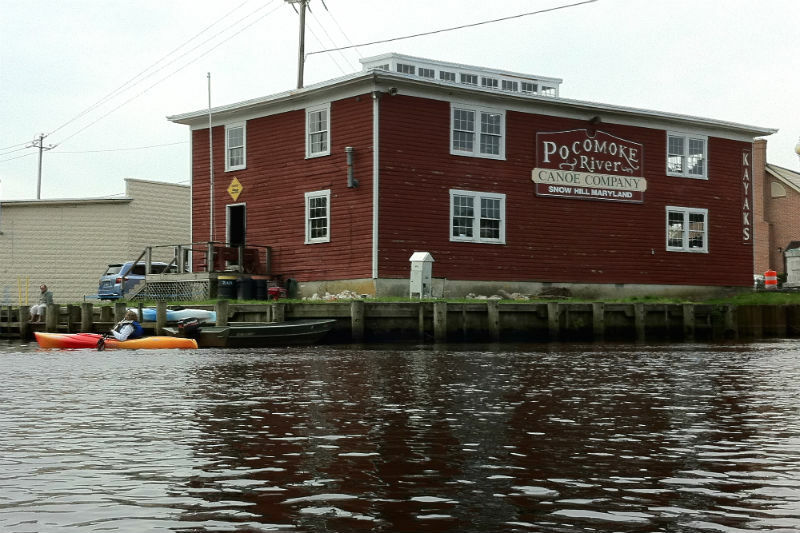 The Pocomoke River Canoe Company can outfit you with a kayak or canoe, and offer guidance on traversing one of the most scenic flat water trails for kayaks and canoes. Every visitor who enters Snow Hill through its north entrance crossing the Pocomoke River sees this restored 1920s Corddry Company warehouse. 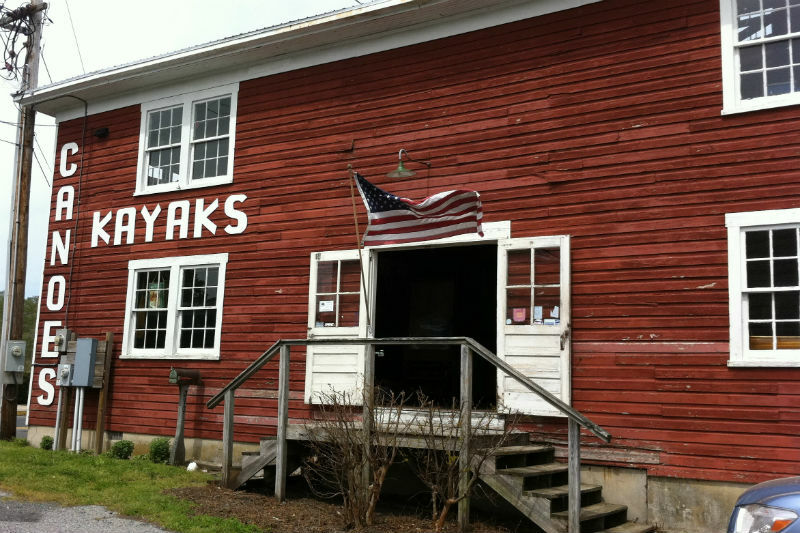 The building sits smack on the river, an ideal location for a company renting and selling canoes, kayaks, stand-up paddle boards and all the gear needed to go with them. The Pocomoke River (pocomoke is an Indian word meaning black water) is the deepest river for its width in Maryland, and provides some of the most scenic flatwater canoe and kayaking trails in the Mid Atlantic region. Unlike most of the Eastern Shore Rivers that wind through open marshland, the Pocomoke and its creeks and tributaries run through forest. The bald cypress trees that line the river and populate the thick Pocomoke Forest seep a coffee colored sap into the river giving it its dark color. The cypress “knees” that push up from the roots of the trees can be seen along the shoreline which makes for an interesting landscape when canoeing or kayaking. The Pocomoke River Canoe Company not only rents and sells flatwater boats and gear, it also provides guide service and portage – meaning they’ll take you to a location such as Porters Crossing, Shad Landing, Red House Road or Chincoteague Bay; then they’ll outfit you with the right gear, guide you down the water trail (if you need it) and pick you up at the end of the trail and transport you back to your vehicle. They offer group tours, and group discounts, can provide lunch and can even give a brief lesson on kayaking to old ladies who have never kayaked before. 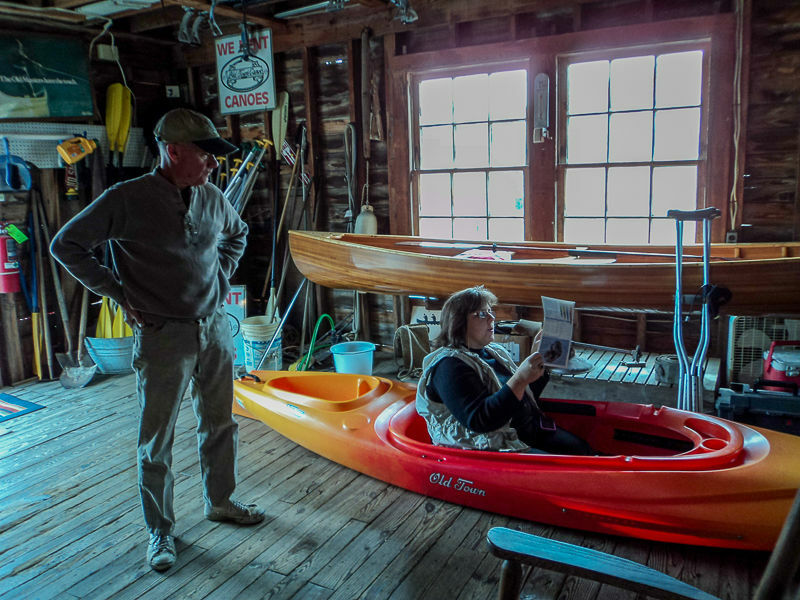 The Travel Hags had their very first adventure at the Pocomoke River Canoe Company. We told them we had a group of 4 ladies who wanted to kayak. All were over 50 years old. Two had never kayaked, one had kayaked one time and had a bad experience, and one (me) was an experienced kayaker but had her right leg in a hard cast. We asked if they could help us have a good group paddling experience and they said yes. See how well they did in this 54 second video entitled Hags on the Pocomoke – or Fat, Old Ladies Can Kayak. The tender loving care we got from the staff was first rate. The short video below shows Ron Pilling giving us pointers and telling us how easy it is to kayak. It also shows Sandy Saunders getting into a kayak for the first time with the help of the Pocomoke River Canoe Company staff, and taking off down the Pocomoke. Located just a 30 to 40 minutes from the Atlantic Beaches, the Canoe Company makes a great day trip when you’re on vacation at the beach, and offers an opportunity to see a different landscape in Worcester County. Don’t fear if you’ve never kayaked or gone canoeing. These guys have all you need to get set up and paddling. Hours: Seasonal – call in April and leave a message. open in Spring on weekends, every day in summer, closed in the winter. Every year millions of people cross a bridge to travel to the Atlantic Beaches on Delmarva. It may be the Chesapeake Bay Bridge, Chesapeake Bay Bridge Tunnel or a bridge over the Delaware Canal. They may be headed to Ocean City, Chincoteague, Rehoboth, Bethany, Dewey or Assateague, but most don’t know about the fabulous sites and attractions they are passing by. This series offers 100 fun things you can do between the Bridge and the Beach encouraging visitors to pull off the highway, take a day trip, and widen your vacation scope of activities – or make the Eastern Shore a destination when you’re not headed for the beach. I love to kayak. This is so much fun and relaxing. This fat girl & the kayak is a perfect fit! All you need is your camera and your phone. Thank you Mindie for introducing me to this. You taught me a lot, Sandy. Your spirit for adventure is one of the things that spawned the Travel Hag adventures. Thanks for always supporting us.